In the previous node, you ordered an entire group. But sometimes you just need to select some elements in a certain order. For example, if 10 students enter a poetry contest and you again need to pick 1st, 2nd and 3rd place. How many ways could you pick them? 10! would give you the number of ways to order all 10 contestants, but you just need to pick 3. (n permute r) in a calculating device. In the poetry contest example, you could just do (10 permute 3) = 720. However, you sometimes need to know how permutations work, since the formula cannot be applied in all cases. 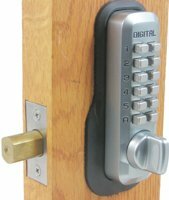 On many house locks, each button can be used only once in the code. Given a lock with 12 buttons, how many possible codes are there that are either 4 or 5 'buttons' long? I like where you are going with these challenges, but would like to see more examples. Some of the working can be tricky to understand. One way of doing this would be to show 1 or two examples with failure to show how not do calculate some of the challenges. Having a good understanding of what not to do can be just as powerful or greater to the student then just finding the correct answer. @Joshua Thank for your feedback. I think that's a good idea, and I will look into doing it. However, I'll want to balance it with making it easy for people to look up how to do a specific topic without being distracted by the incorrect approach. Great explanation, but isn't 7! = 5040? Do you mean 6! = 720? Sorry the division line wasn't showing clearly.